PARTICIPANTS WHO WISH TO SHOW THEIR CARS SHOULD FILL OUT THE FORM AT THE BOTTOM OF THE FLYER AND SEND IT AND $20.00 TO NANCY SISKA IN ENOUGH TIME FOR HER TO PROCESS YOUR PREREGISTRATION. 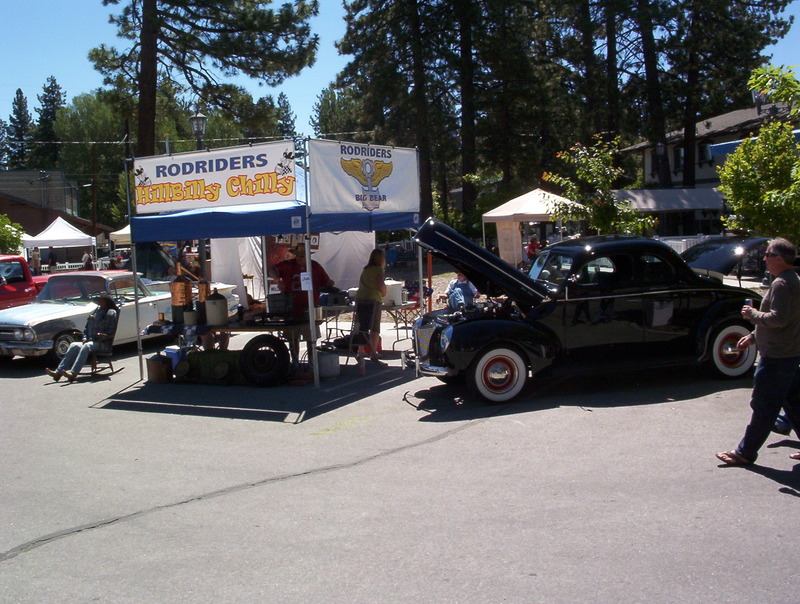 THERE WILL BE “DAY OF THE EVENT” REGISTRATION AT THE “RODRIDERS BOOTH” AT 8:00 am SATURDAY MORNING. Club news: Meetings continue at the Chamber of Commerce in Bartlett Parking lot on the second and fourth Tuesday of the month at 7:00 PM. 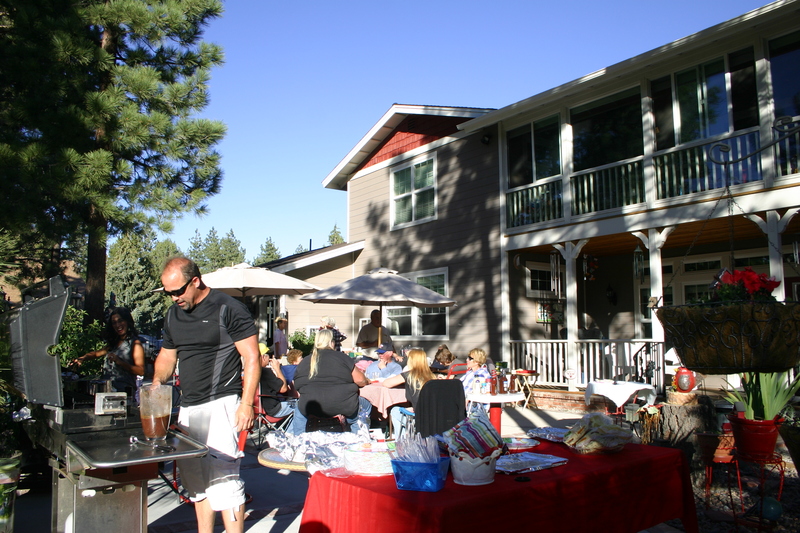 The next meeting is Aug. 9 2011. Carl’s junior car cruise is now in full swing and is every Wed. at Carl’s Jr from 5 to 8PM. Air show Aug. 6th. Cars will need to be at the airport at 6:30 on Saturday morning and we will be told where they want are cars to park. We will be able to have 15 cars in the show. DoDah parade on Saturday July 30. Meet at North Shore Tavern in Fawnskin at 8am Saturday morning. Parade starts at 10:00 am. Please bring 5 dollars to donate to the explorers for carrying our banner. Larry Huffman will be on stage at the PAC on Aug. 5, 6, & 7 in the play ,On Golden Pond. Tickets available from Larry or the PAC box office, Let’s all get together and take our cars for the Sunday 1:30 show. Meet at the PAC between 12:30 and 1:00. 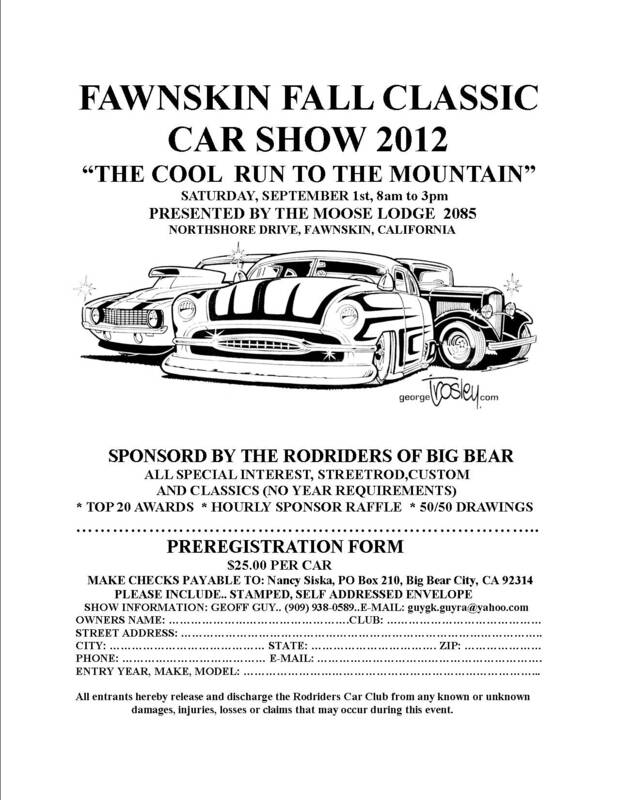 Fawnskin car show flyers are out. Next car show meeting is on Aug 2 at Bartlett parking lot at 7 pm. All are welcome and many are needed to make the car show work. Please start collecting Raffle prizes and getting sponsors for the show. 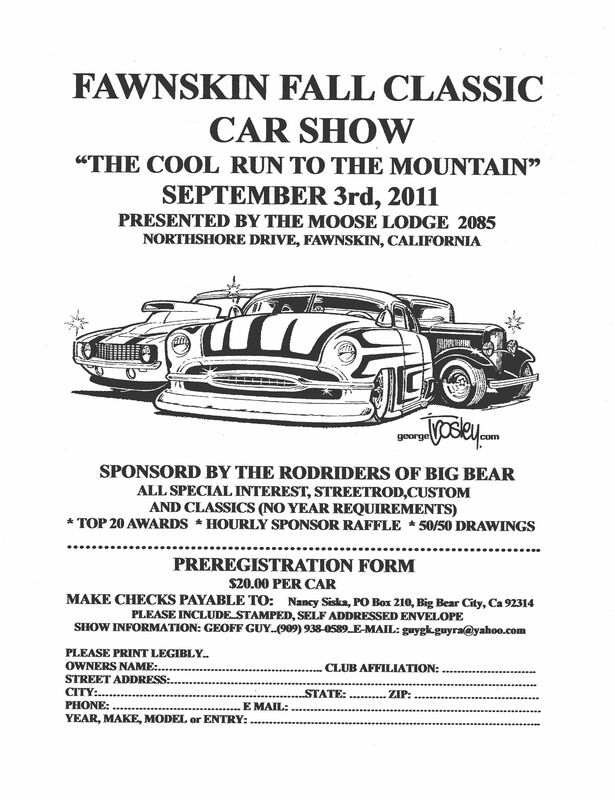 Please bring car show registration money, $20 to next meeting and fill out a registration form. Next meeting is on Aug 9th at 7 pm. We usually leave around 3:30 PM to get good spaces; there are 4 more dates after this date. HI, everyone remember that our next meeting is on Tuesday, July 26 at 7 pm. See you all there. 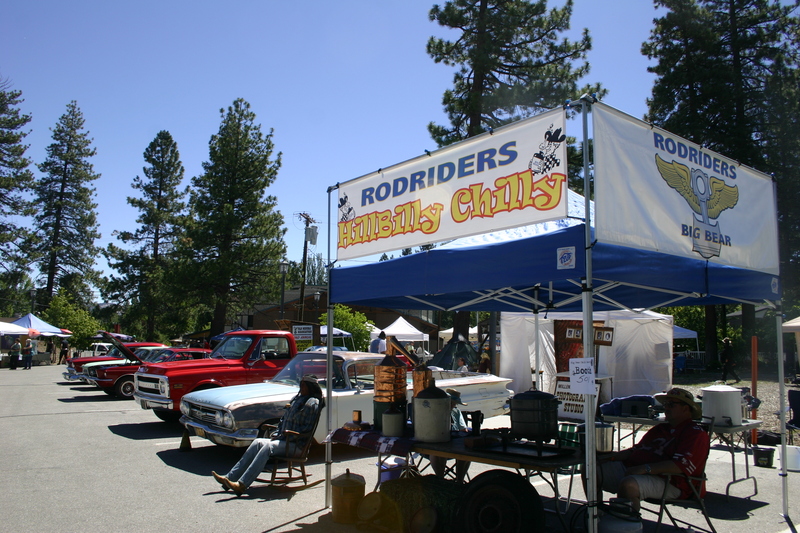 THE RODRIDERS PARTICIPATED IN THE “PEOPLES CHOICE” PORTION OF THE CHAMBER OF COMMERCE CHILI COOKOFF AT THE BARTLETT PARKING LOT.. 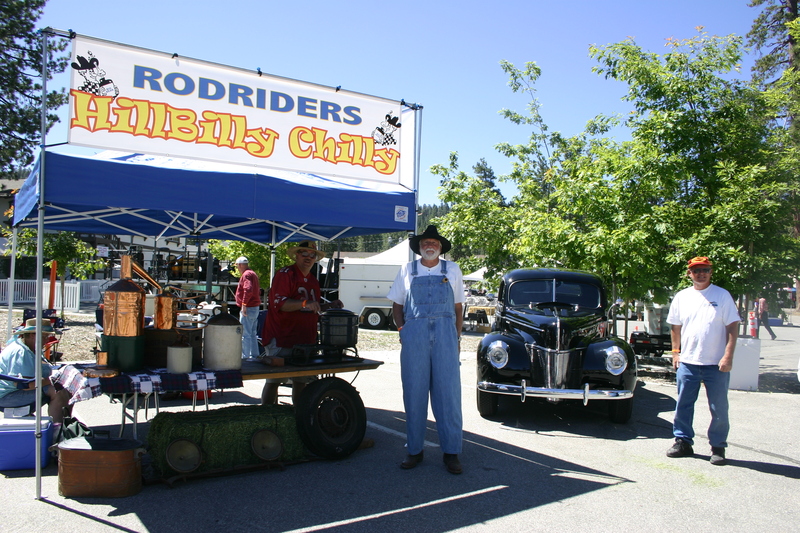 THERE WERE A FEW RODRIDER MEMBERS THAT WHO SUPPLIED THEIR VERSION OF THE SISKA’S CHILI RECIPE..MIXED TOGETHER BY OUR OFFICIAL CHILI TASTER..JOE SISKA..WE HAD AN OUTSTANDING CULINARY DELIGHT.. 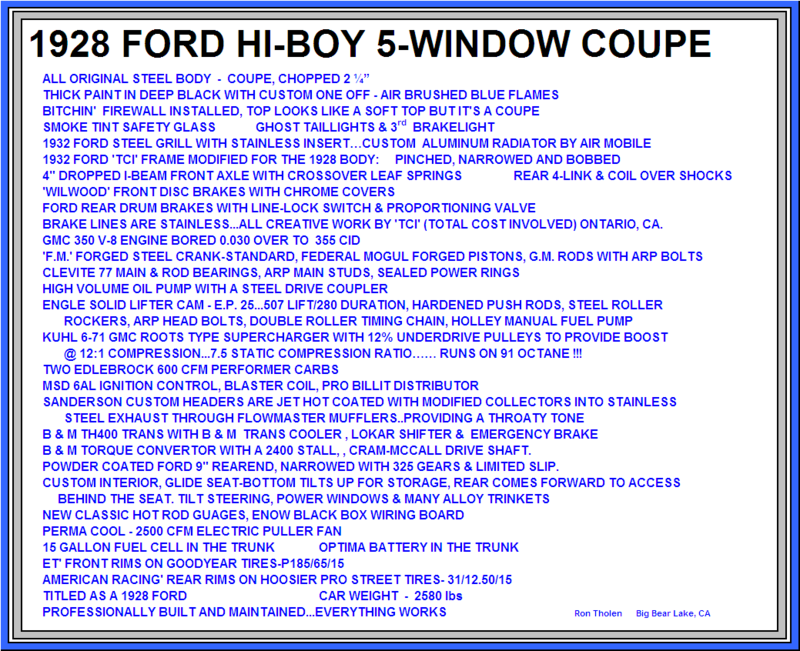 THE CARS WERE A BIG HIT..ESPECIALLY RON KINGS 40 FORD COUPE..RON SPENT HIS TIME TALKING TO FOLKES ABOUT HIS 40..AS MOST PEOPLE HAD NEVER SEEN A VINTAGE CAR ..RESTORED TO THAT KIND OF PERFECTION..
Pat and Jens post was right on. Eloise and I thoroughly enjoyed ourselves. 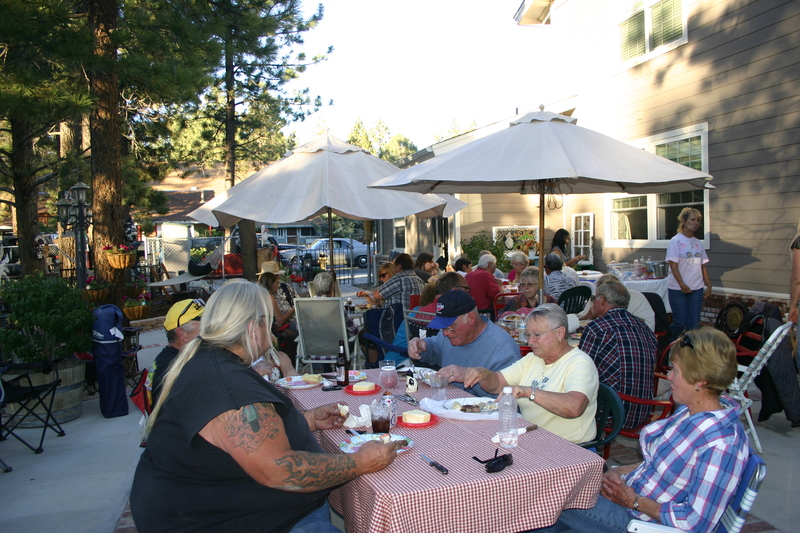 The food was excellent, but more than that, the atmosphere was perfect. Weather was outstanding and all the people that attended were were friends besides car club buddies. Thank you Ron & Mary Lou for a great time with great people. We appreciate your hospitality and friendship. PM. The next meeting is July 26th at 7 PM. Jr from 5 to 8PM. King and Dave Lepore are going to help out on Friday parking vendors. towards explorers carrying the banner. line up at 9am in Fawnskin.